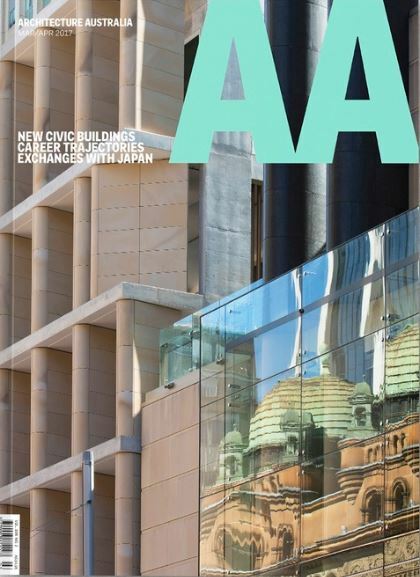 478 George Street and QT Melbourne by Candalepas Associates have featured on the cover of the March/April 2017 edition of Architecture Australia. Recalling Rafael Moneo’s Murcia Town Hall, or the chiaroscuro contrasts of a Giorgio de Chirico town square, the facade is an almost musical notation of light and shade. There is the grand-order terrace that opens and closes views to the QVB at levels five and four. The exuberant tapestry of the Victorian facade is in your face, while at the same time the AHL building exerts its own muscle and spatial exhilaration: it is neither subservient nor insensitive to context but sets up the synergetic perception of old and new. And there is the triple-nested portico at the entrance: a miniature of Carlo Scarpa’s Brion Cemetery – coffered concrete and gold leaf that scoops light from the brightness of the street and transfigures it to something more luminous and ethereal.